The Confederate soldier was revered by Northerners and Southerners alike long after the war ended for the gallant and romantic aspects of his character. 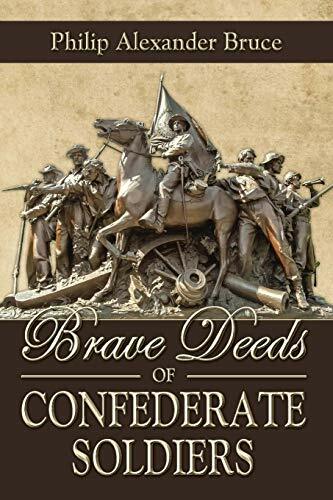 The author's vivid account of numerous deeds of daring, bravado, cunning, and selfless courage by Confederate partisans during the War of 1861-65 will fire the young reader's imagination - and impress upon him the all-important lesson that some causes are worth risking everything to defend. Philip Alexander Bruce was a prolific Virginian historian who specialized in the history of the Commonwealth. Bruce was born in 1856 to a plantation family in Charlotte County, Virginia. He studied literature and history at the University of Virginia, graduating in 1876, and went on to earn an LL.B. from Harvard University in 1879. He served as the corresponding secretary of the Virginia Historical Society and was awarded honorary doctorates at both William and Mary College and Washington and Lee University. In the final decade of his life, he co-authored the comprehensive five-volume History of Virginia with fellow Virginian historians Lyon Gardiner Tyler and Richard Lee Morton. He passed away at his home in Charlottesville, Virginia in 1933 after a long illness.